Pvt. Alan MacAllister, left, got some help from Hanson Police in surprising his mom at a staged traffic stop while coming home to visit with his aunt. courtesy photo. HANSON — Army Pvt. Alan MacAllister of Hanson pulled out all the stops when he returned home to surprise his mom Darlene Humes-MacAllister at their Maquan Street home. He had been in cahoots with Lt. Joe Yakavonis of Hanson Police to plan it for days before his return. With help from Hanson Police sergeants Michael Casey, Michael Bearce and Officer Doug Smith, they pulled over Humes-MacAllister as Alan waited in the squad car — with mom Darlene not noticing a thing. Unbeknownst to Darlene, Alan had already been home and saw his aunt, had breakfast with friends and was gearing up for her big surprise. “At first I was scared when I got pulled over and was worried what I did,” she said. Sgt Casey. mentioned her inspection sticker being expired and then walked behind her. “ … I turned and there was Alan,” she said. He came home to see his aunt. She has special needs and has been battling cancer. “She has a short time left,” Humes-MacAllister said. A bittersweet time for his return but he is very caring and has a close relationship with his aunt. He will also see his older brother Stephen Curtin among all his friends and classmates. Chief Michael Miksch of Hanson police was pleased that his officers had arranged to assist a hometown soldier. “Anytime we can do something for a service member it’s a small thing compared to the commitment they make for our country,” said Miksch, who is also a veteran. Sgt. Casey who drove Alan to “pull over” his mom called the moment “heart-felt,” seeing them embrace. “We are glad to be a part of these types of stories,” he said. He has a big heart and he is a very caring son, said Humes- MacAllister. Growing up in town Alan was well known. He was involved in the Boy Scouts under David Winters of Hanson. 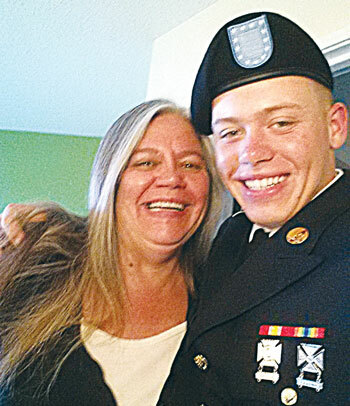 He started the annual flag retirement ceremony with his mother and Winters, a tradition carried on now for eight years on Flag Day at the Hanson American legion. MacAllister helped kick off the parades each year for Memorial Day handing out flags with his mom and for many years walking with the Boy Scouts. He is now an Officer at the Sons of the American Legion for the past four years. Humes-MacAllister is President of the Women’s Auxiliary and former longtime vice president. The family has a long history of being active with the veterans and Hanover VFW. Alan grew up installing flag poles all over the south shore with the former J.J. Brown flag company and his granddad, former Navy man Phillip H. MacAllister, who died in 2007. McAllister will specialize in engineering. He completed his basic training at Fort Leonard Wood, Mo. He will return back to base at Fort Carson, Co. after his one-week leave. A 2014 graduate of South Shore Vo-tech, he was active in football, baseball, and simultaneously graduated from the Bourne Sea Cadets one day after his SSVT graduation. In his early teen years Alan was not one to let things slide. He petitioned the town and local officials to get a stop sign placed at the corner of Maquan and Crescent Street because he had seen so many accidents at the dangerous merge. He brought his concern to Congress with letters being delivered to five different people and he got that stop sign put in place. The video of the Hanson Police pulling over Darlene and delivering her soldier has been viewed on social media over 50,000 times on Monday alone. “There has been nonstop beeping all day people waving as they drive by,” she said. “We hugged. I mumbled a few things to him,” she said laughing. “We are pranksters in our family and this was awesome. This was big, but I am working on a good one to get him back,” said Darlene.